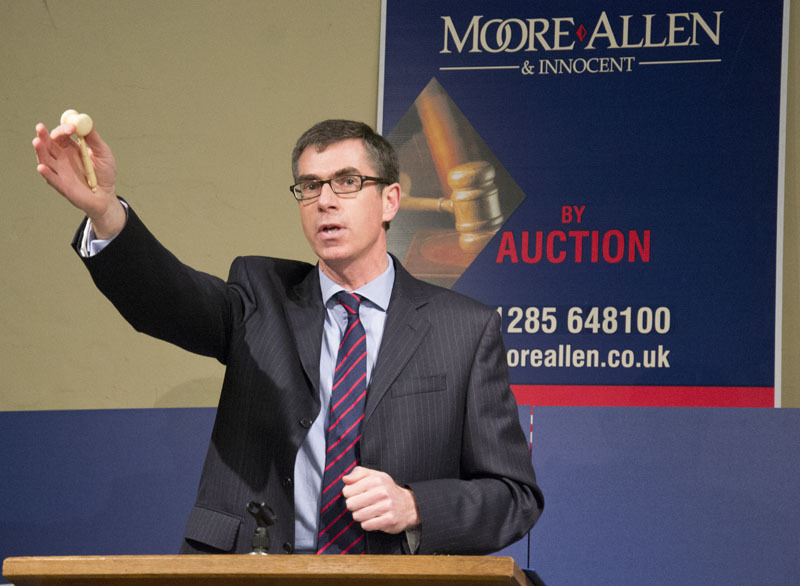 No fewer than six bidders were chasing the property at a packed auction, conducted by Moore Allen & Innocent in Norcote on Thursday (February 12). On two occasions auctioneer and estate agent Roy Bowyer raised the gavel before another bidder jumped in to drive the hammer price ever upwards. “There’s a lot of interest in this property,” Mr Bowyer told prospective buyers before starting the bidding at £180,000. The detached house, at Pheasant Way, sparked a ding-dong battle between potential buyers as Mr Bowyer teased out bids £1,000 at a time. The property was one of three successfully sold at the auction. With two bedrooms, one reception room and gardens, the cottage easily attracted a starting bid of £170,000, and the hammer fell at the guide price of £190,000. The third property sold at smack in the middle of its £245,000 to £255,000 estimate. The semi-detached period cottage – part of the former Kemble Farms Estate – was described in the particulars as ‘in need of updating’ and Mr Bowyer reminded bidders that the property enjoyed ‘lovely views’. The cottage was listed as having three bedrooms, two reception rooms, a kitchen and utility room, gardens, and off-road parking. But the main attraction of the property was always going to be the proximity to Kemble railway station, with a mainline connection to London Paddington in 75 minutes. Again, the gavel was raised twice before new bids pushed the hammer price to its £250,000 resting place. This entry was posted in auction, Property and tagged auction, Cirencester, Cotswolds, Moore Allen & Innocent, Property. Bookmark the permalink.